Italian Lemon Ricotta Cookies made with a quick lemon infused sugar and dipped in a lemon glaze for a delightful all around citrus scent. They’re all dressed up in gold nonpareils and ready to grace any holiday cookie platter with some merry cheer! While some people are dreaming of a white Christmas or even getting an early start to a flurry of holiday shopping, I’m living and breathing cookies in all shapes and forms. Shopping is pushed to the sidelines in anticipation of the glorious sweet treats begging to come to light. 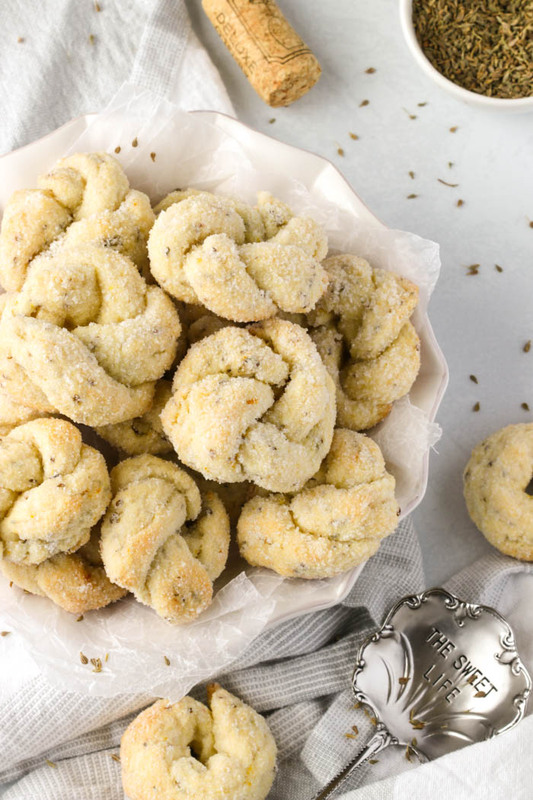 What better way to ease into holiday baking then with these adorable Lemon Ricotta Cookies! They’re extremely popular in Italian households especially around the holidays with each family having their own unique way of decorating these citrusy morsels. These cookies are extremely soft to the bite. They also have a very cake like texture which are sure to appeal to all you die hard cookie fans! 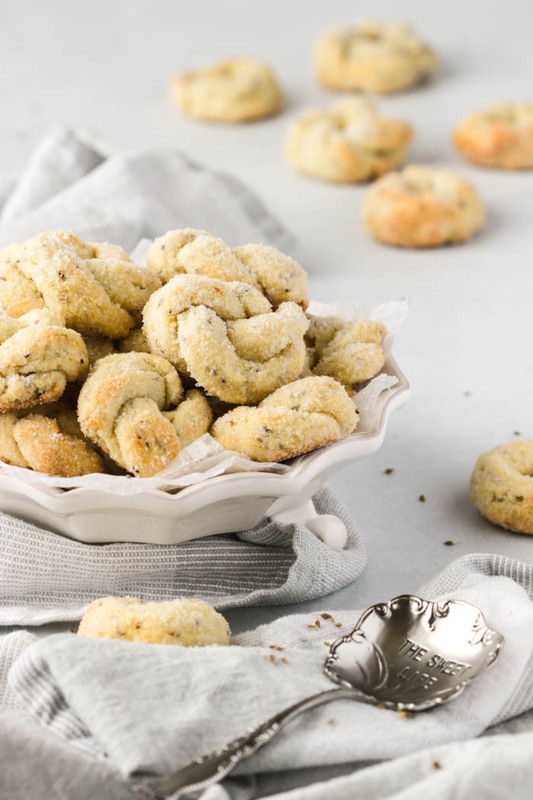 They’re inspired by Canadian Living Magazine’s ricotta cookie from their latest holiday issue. I’ve made a few switch ups which will definitely appeal to all lemon lovers. 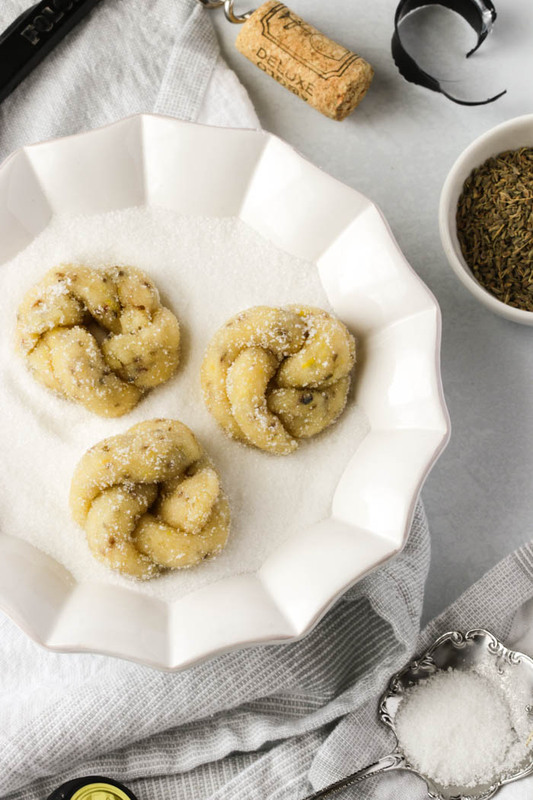 To achieve an all around citrus taste in the cookie dough, I added lemon zest and made a quick lemon sugar by pulsing together the lemon zest with the granulated sugar in my mini food processor. Alternately, if you don’t have a food processor simply beat the butter, sugar and zest all together. I omitted the baking soda altogether and increased the baking powder from 1/4 teaspoon to a full teaspoon as this yielded a plumper cookie which did not spread out overly much. They resembled these perfect little round soft and fluffy pillows. Also for uniformly round cookies I used a 1 1/2 inch round cookie scoop but you can just as easily measure the dough out with a rounded tablespoon. I opted out of the cream cheese icing and decided to make a luscious lemon glaze. You can also customize the thickness of the lemon glaze to your taste. Adding less lemon juice to the icing sugar will result in a thicker glaze. Or, if you prefer a thinner glaze try adding a little more lemon juice. Do keep in mind though that these cookies absorb quite a bit of the glaze, especially a day after. So if you want that white glaze appearance make sure the icing is not overly thin. I had full intentions to test out whether these ricotta cookies would freeze well and therefor make a great bake ahead dessert. However, they lasted 1 full day in my freezer because greedy hands quickly devoured the cookies! They’re that delicious! But don’t take my word for it! Bake them yourselves and tag @marisasitaliankitchen on Instagram so I can see your creation! 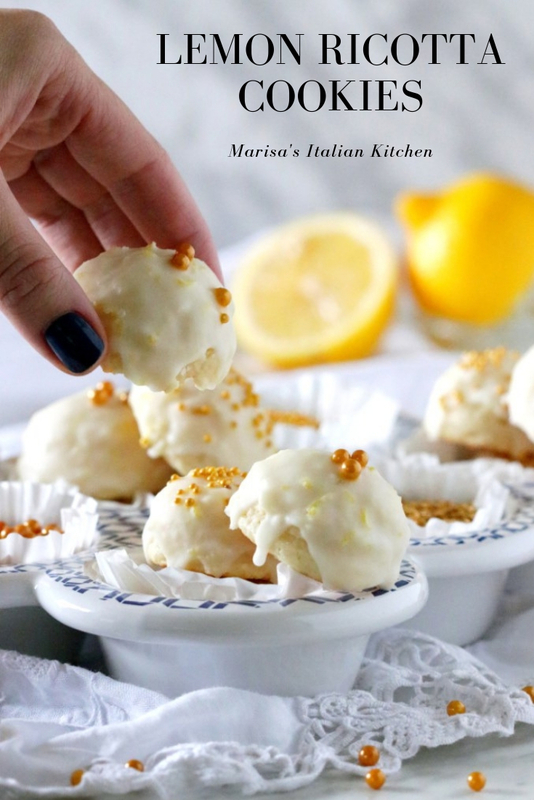 These classic Italian Ricotta Cookies are extremely soft and cake-like in texture, are dipped in a lemon glaze and topped with golden non-pareils. Line 3 cookies sheets with parchment paper as this will make for easy release of the cookies and set aside. Pulse the granulated sugar with the lemon zest in a food processor for about 1 minute so as to infuse the sugar with the lemon scent. Place the lemon sugar and the softened butter in a large bowl and beat until fluffy. Beat in the egg, ricotta cheese and the vanilla until well combined. In a medium sized bowl whisk together the flour, salt, baking powder and stir this into the ricotta mixture. Using a small cookie scoop of about 1 1/2 inch in size, scoop out the dough onto the prepared baking sheet, spacing them about 2 inches apart so that they have room to expand. Or simply measure out a heaping tablespoon if you don't have a cookie scoop. Bake in the preheated oven for about 12 to 14 minutes or until the bottoms are golden in color. Transfer to a wire rack to cool completely and in the meantime prepare the lemon glaze. Place the icing sugar and lemon zest in a medium sized bowl and whisk in the lemon juice 1 tablespoon at a time, until a desired consistency is achieved. Dunk the top of the ricotta cookies into the lemon glaze and place on a wire rack with a tray underneath to catch any drippings. Sprinkle with nonpareils of your choice and then allow the lemon glaze to set before serving. Inspired by Canadian living Magazine and tweaked with a few switch ups for personal taste. Soft Blueberry Amaretti Cookies made with blanched almond flour and scented with sweet amaretto di Saronno liqueur. Studded with reconstituted dried blueberries and coated in icing sugar they make a truly delectable gluten free treat. When just recently I was asked if I had a gluten free cookie recipe, amaretti cookies immediately came to mind. As I set out coming up with a recipe I then decided to elevate this popular Italian cookie with the addition of dried blueberries. These dried sweet berries caught my eye every single time while strolling by the candy laden isles of Bulk Barn. After going through quite a bit of almond flour and dried blueberries I finally achieved one I was satisfied with. It only took 5 attempts and 2 weeks later…lol! There are two different kinds of Amaretti cookies. The crisp and crunchy variety or the soft and chewy kind. Both are undeniably delicious and a true Italian classic. Much like their French cousin le macaron, these Amaretti cookies have a light crispiness on the outside and soft chewy centers that are light as air. As legend has it these cookies date way back to the renaissance period. At a time when a newly married couple from Saronno Italy presented the bishop with their original family cookies made with crushed apricot kernels, egg whites and sugar. In return the bishop blessed the couple with a long and prosperous happy marriage. We’re not using apricot kernels in this recipe as there is some speculation on how safe their consumption really is, so there is no need to dash off somewhere in search of them. We are however using blanched almond flour which is basically ground almonds without their skins and a much finer flour. 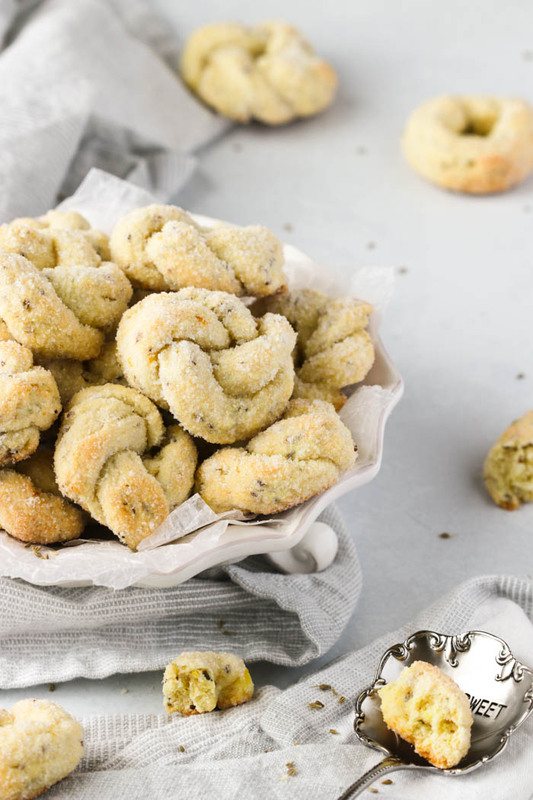 Almond flour is known to add moistness to baked goods and delivers such a sweet taste which is simply perfect when baking up a batch of these soft amaretti cookies. Although you most certainly can grind up whole blanched almonds to a flour like consistency, this can get a little tricky. You will have to take care that it does not turn into a nut butter as its grinding. Both the almond flour and dried blueberries can be found in the specialty food section of most grocery stores or head on over to Bulk Barn if you should be so lucky as to have one nearby. Lets make perfect Soft Blueberry Amaretti cookies. Amaretti cookies are not difficult to make and shape out but it does take a little practice to get perfect little domes of goodness. Use the amount of almond flour as a guideline because this will depend on the quantity of egg whites used. I used egg whites from 3 large sized eggs. You can use a teaspoon or even better a 1 1/4 inch round ice-cream scoop for even sized cookies. Scoop the dough onto a plate filled with icing sugar and turn to coat all over. Finally, shape the dough rounds between the palm of your hands into the size of a walnut in its shell. You’ll find the dough soft and pliable to work with and will not spread too much during baking. If your dough seems too soft to roll and hold its shape then simply fold in some extra almond flour, about 1 tablespoon at a time. When they’re ready the amaretti will have golden brown tinged bottoms and soft centers. Allow to cool on the baking sheet placed over a cooling rack because they are very fragile while still warm. Due to their softness, you’ll want to let them cool sufficiently before lifting them off the baking sheet. I adore the little burst of sweetness that the blueberry imparts with every single bite and I find they elevate these little plump morsels to a truly special treat. Some will have sweet blueberries peaking through while others…well you’ll simply have to bite into one to discover its hidden fruit! Do try them and enjoy…I know you’ll love them! Gluten free Soft Blueberry Amaretti Cookies scented with amaretto di Saronno liqueur, studded with reconstituted dried blueberries and coated in icing sugar. In a large bowl, using a hand held mixer with the whisk attachment, beat the egg whites until soft peaks form. Gradually whisk in the sugar just until combined. Fold in the almond flour then the honey, amaretto and a pinch of salt. Gently fold in the reconstituted and well drained blueberries. Use an ice cream scoop about 1 1/4 inch in diameter to scoop out the dough, rolling it generously in the icing sugar. Roll the cookies between the palm of you hands to shape them roundly about the size of a walnut in its shell and place them on the prepared cookie sheet. Bake in the preheated oven for about 13 minutes. When ready the cookies will have golden brown tinged bottoms and soft centers. Transfer the cookie sheets to a cooling rack and let them cool completely before lifting them off the pan. Cookies can be stored in an airtight container with wax paper between the layers. Reconstitute dried blueberries by placing them in a small bowl and pour just enough hot water to cover and then let stand for about 15 minutes. Most of all, allow to drain well before proceeding with the recipe. Baci di Dama or rather Lady’s Kisses are melt-in-your-mouth hazelnut cookies. They’re nestled together with a dollop of dark sinful silky chocolate. 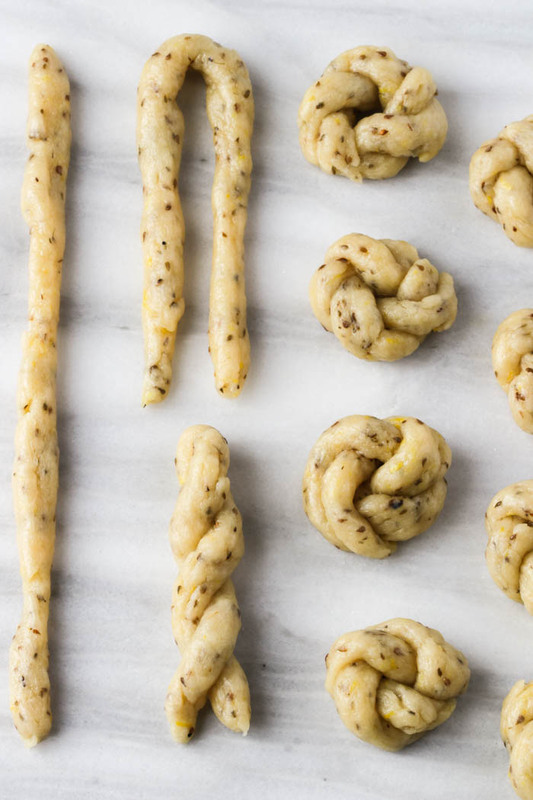 These light and delicate hazelnut morsels are one of Italy’s famous cookies. They were made popular by the pastry shops of Tortona in the province of Alessandria which is in the Piemonte region of Italy. Small wonder at that as hazelnuts from Piemonte are said to be the very best and also legally protected as “Nocciola Piemonte I.G.P”. Although the history of Baci di Dama are somewhat hazy, what people most agree upon is that they resemble sensual lips pursed together while longingly bestowing a kiss on a loved one. The chocolate being the glue that softly binds a lovers lips together. Glancing through a wonderfully illustrated cookbook titled “Dolce, Italy’s Sweets” by Francine Segan, I came across these sweet little morsels. I knew I would be making them one day soon. With Valentine’s Day just around the corner these cookies are a perfect timing and make a lovely celebratory treat. Although the first batch I tried certainly did not lack in flavour, they looked nothing like the cute little domed baci I had seen in the photo. Niente! My cookies had spread out considerably and were somewhat flat rather then dome shaped as they were meant to be…(photo below). Although, I did suspect that I had not incorporated the butter well enough, especially after seeing small clumps of butter in the dough as I rolled them out into little balls. Also, my food processor is a 4 cup capacity and probably too small for this amount of cookie dough. I continued my quest and searched for the perfect domed shaped baci di dama. However after a little research it was quite clear that there is a rather standard ratio of equal amounts of hazelnuts, flour, sugar and butter. Going back to Francine Segan’s recipe, I decided to give it another go with a few modifications. Therefore, the second time around I opted to mix the flour with softened butter by hand in order to get a more cohesive dough. I also increased the amount of hazelnuts by a 1/4 cup. This yielded a dough that was much easier to roll without having to use extra flour in the rolling process. Finally, I added a pinch of fine sea salt simply to brighten the flavors and make them pop! Most noteworthy here is to bake the cookies at a lower temperature. For my oven 300 degrees F. was spot on. This lower temperature helped the cookies retain their round shape during the baking process without over browning the cookies too much. 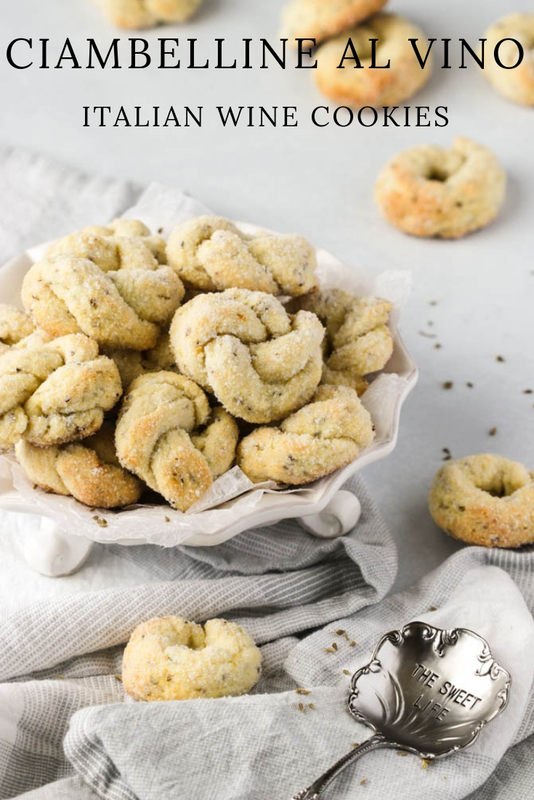 With a lovely crumbly texture these classic Italian cookies are wonderfully fragrant which are largely due to the roasted hazelnuts. After biting into one of these delicate cookies, I found them to be very reminiscent of the Baci chocolates whereas my hubby insists that they are far more similar in taste to the Ferrero Rocher. You will most certainly have to bake them and decide for yourself! Make sure to finely grind the hazelnuts with the 2 tablespoons of sugar. Chill the dough in the coldest part of your fridge at least two hours (overnight is best). Roll the cookie balls into the size of a hazelnut in its shell then chill for an additional 2 hours or if short on time freeze the rolled cookies for 1/2 hour. Bake one cookie sheet at a time at a low temperature of 300 degrees F, while keeping the remaining cookies well chilled. Do not over bake the cookies as this will change the texture of the cookie. The cookies are very fragile once out of the oven so do not touch them (they break easily). Allow to cool on the cookie sheet placed over a cooling rack. Make sure they are completely cooled before filling with the melted chocolate. Allow yourself plenty of time and never rush a good thing! They are so worth it! Baci di Dama or Lady's kisses are melt-in-your-mouth hazelnut cookies nestled together with a dollop of dark silky chocolate. Place the hazelnuts with 2 tablespoons of the granulated sugar in a food processor. Process until the hazelnuts are finely ground. (leave in food processor). Combine the remaining sugar, flour, a pinch of salt and the softened butter in a medium bowl. Use your fingers or a pastry cutter to work this mixture just until the butter is evenly distributed and resembles clusters of streusel topping. Add the flour and butter mixture to the hazelnut mixture in the food processor. Pulse till the dough comes together in a dense mass. Shape and flatten the dough out into about a 6 inch round disk. Wrap the dough in saran wrap and refrigerate for a minimum of 2 hours. (I chilled my dough for 4 hours). The dough should be very cold and firm. Unwrap the disk of dough and cut 1/2 inch strips. Working with one strip at a time, cut the strip into 1/2 inch pieces of dough and roll each piece into smalls balls about the size of a hazelnut in its shell. Place the balls on the parchment lined cookie sheet while spacing them about 2 inches apart. Once you have filled one cookie sheet, place it in the fridge and repeat with the remaining cookie balls. Chill the rolled cookies for about 2 hours or if pressed for time freeze for 1/2 hour. When ready to bake, preheat the oven to 300 degrees F.
Bake one sheet at a time for about 13 minutes. They should look light golden in color. Place the cookie sheet onto a cooling rack and let cool completely. Repeat with the second cookie sheet. Let the baked cookies cool completely before filling with the melted chocolate. When ready to assemble the cookies place the dark chocolate chips in a microwave safe bowl and melt it on high for about one minute stopping to stir at 30 second intervals. Use a small spoon or fill a piping container with the melted chocolate and put a dollop of chocolate on the flat side of a cookie. Top (flat side down) with a second cookie while pressing down slightly to form a sandwich. Adapted from the cookbook, Dolci Italy's Sweets by Francine Segan with a few modifications. 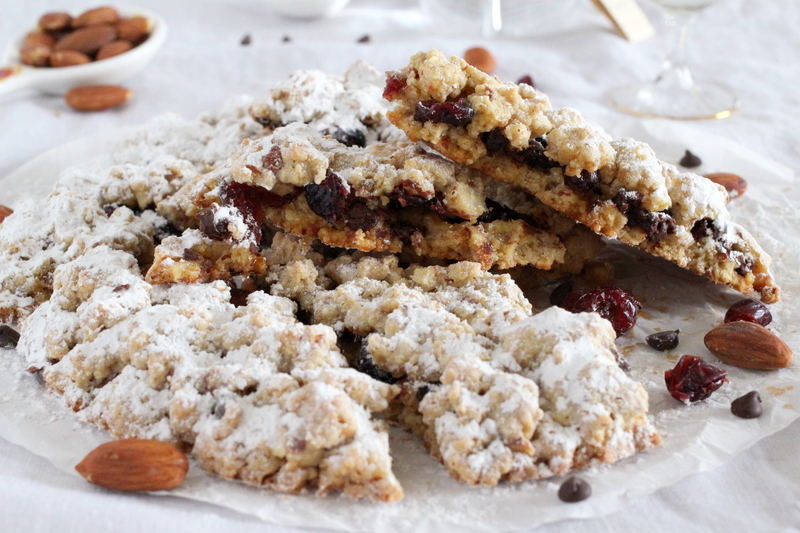 Fregolotta simply means one big crumb in Italian and that’s exactly what this cookie is. 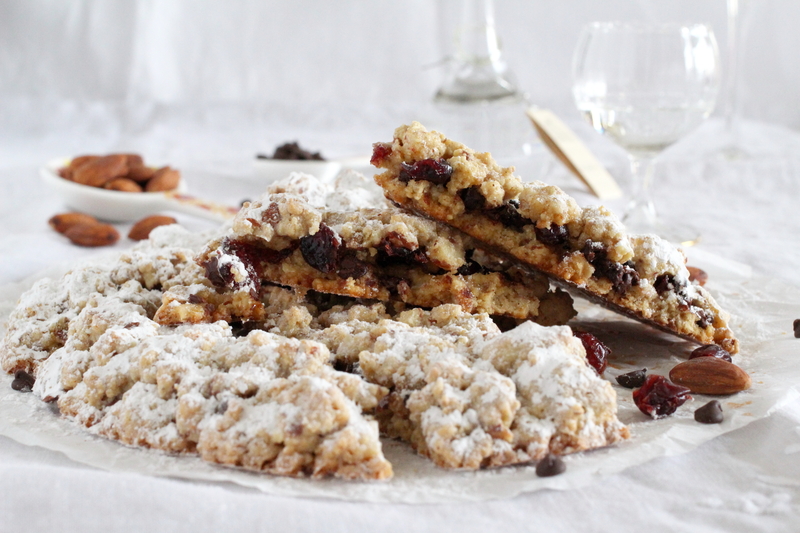 A huge Italian crumb cookie with mini chocolate chips, dried cranberries and roasted almonds nestled within. There is such a playful appeal to this giant crumb cookie and its sure to bring out your inner child! Originating from Veneto in the northern part of Italy, Fregolotta is a simple and rustic crumb cookie resembling somewhat an English crumble topping. There is not much known by who invented this type of cookie but it dates back to a local baker from the Veneto region at the beginning of the 20th century. 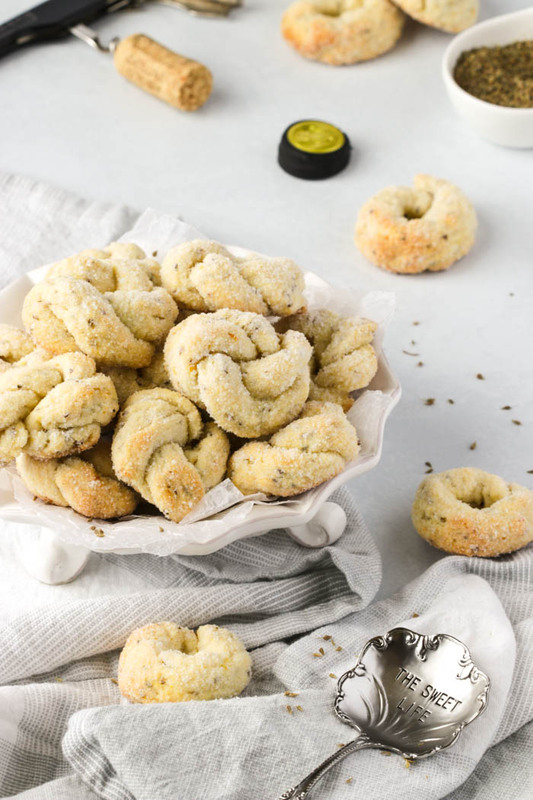 As the story goes, the founder of this bakery had received the recipe from his sister who in turn was given the recipe by a childhood friend working as a cook for a noble family of Terraglio. This type of giant cookie is still being made today by the Zizzola family who own the bakery. Loaded with fragrant roasted almonds and perfumed with both vanilla and almond extracts, this crumbly cookie gets a gritty crunch from the addition of cornmeal. In texture, this giant cookie is crispy around the edges yet still maintains it’s chewiness once baked. I’ve veered away a little from the more traditional Fregolotta by adding mini chocolate chips and the dried cranberries for a more festive feel. However, you can simply omit them for a more authentic Italian crumb cookie. It is customary to bring this giant cookie to the table whole. Once laid out in front of the guests place a few almonds underneath its’ center. Then with a wooden spoon, give it a few gentle wacks and watch it break off into pieces. And that my dearies, is how the cookie crumbles! Fun right!! Aside from being fun to eat, this baking venture is not very laborious. Sometimes throwing in a little simplicity during a baking marathon creates a perfect balance especially during the holiday season when our to do lists are a mile long and some. Having said that, I know you will appreciate how easy this recipe is and also how quickly it comes together in mere minutes especially when using a food processor. Another way of preparing the Fregolotta is simply using your hands. Both ways will truly produce delicious bites! Although perfect anytime of the day accompanied with tea or milk, this Fregolotta is exceptional as an after diner dessert, served alongside a small glass of Grappa for dipping into.